Jeff Smith is best known for titles that younger audiences can enjoy as well as fully grown adults. At least, that used to be the case. His newest creation, RASL, may change all that. 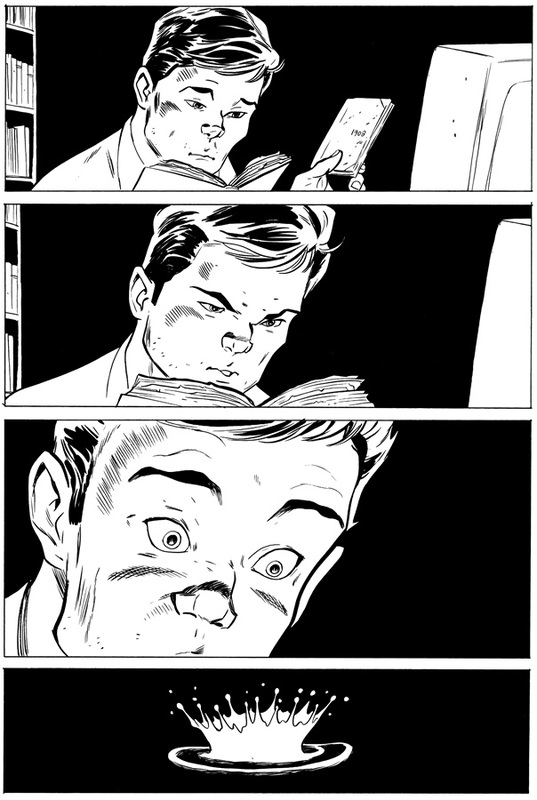 Of course, all-ages appeal isn’t Smith’s only strength as a comic creator. Smith is also known for plots with an air of mystery about them, almost mythical in proportion. You always feel like there is something larger going on behind the scenes. This is still true of RASL, but rather than this larger force inspiring simple curiosity, it fills you with a sense of impending doom. Smith’s new work is a much darker read. RASL is his dark dirty not-so-secret that is bringing in increasing numbers of new fans of his work, mostly those who were put off by the idea of Bone, Shazam!, and so on being so child-friendly and are now seeing a different side to Smith. It’s still an infant title, having been started in Feb ’08 and then running on a very unconventional publication schedule. Currently there are only 9 issues released, 7 of which are collected here. The book seems to be centered around a man called RASL who steals paintings from alternate dimensions for a living. He soon learns there a repercussions for dimension-hopping. We join the story with him wandering the desert in tattered clothes, spots of blood on his shirt. It then skips back in time, leaving you hanging, wondering how he came about to be stuck in the desert in that condition. The first few pages are wordless, adding to this big mystery. As the plot moves back in time, we witness the theft of a Picasso painting with relative ease – after all, he is a professional. Following the successful job, he dimension hops back and pops into a local bar. It is then when we learn that he has to drink to help his body deal with dimension-hopping, to help numb the pain. He decides he could relax easier if there was something good on the jukebox, perhaps a spot of Dylan. To his horror Robert Zimmerman (Dylan’s birthname) is the credit artist on the LPs; Dylan isn’t Dylan. He’s not back in the right dimension! Panic and fear rising, he seeks to get back, but can his body take another hop? First he has to deal with a strange man dressed in a long black coat with a lizard-like face. A man drawing a gun on him. All of this in the first issue. And you might expect it to all be explained by the end of issue one, as is the normal set-up of an “edgy” introductory comic. Smith isn’t that predictable. Even without the explanation, he’s now got you. Hook, line and sinker. 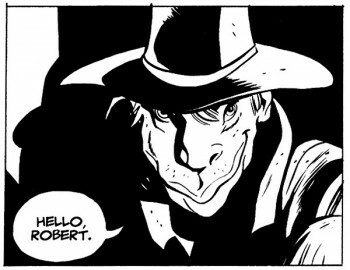 RASL is one seductive book. The plot does move forward, but not in a predictable manner. It’s mixed heavily with flashbacks to RASL’s even more distant past slowly revealing how he got to this stage – although it’s not exactly clear whether things are past, alternate states, or something even stranger. Smith clearly isn’t a physicist but shows that he has done extensive research into this subject matter. A great amount of the science stands up, as long as you assumed it is possible to dimension-hop. Thankfully for the non-physicist, this is purely a bonus feature of the book – you don’t have to understand Maxwell’s Equations to be able to enjoy the story. 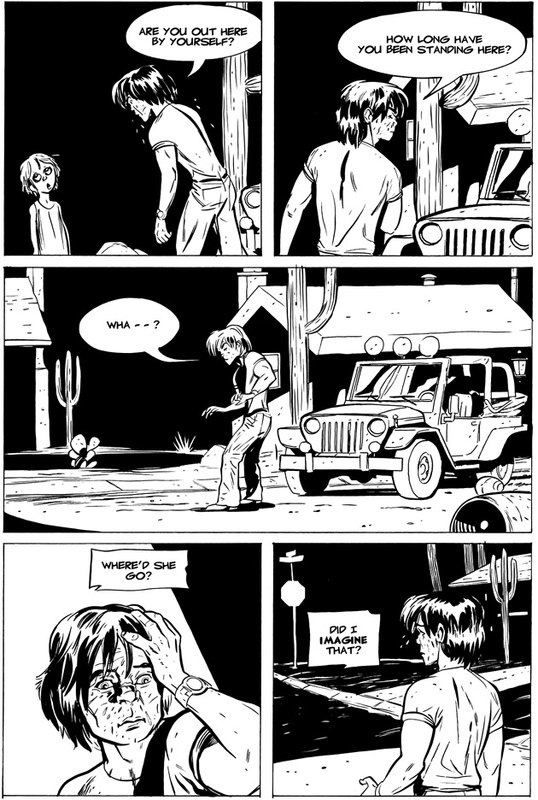 RASL focuses heavily on the humanity of it’s characters, with romantic interests portrayed in a very adult manner (did we mention this isn’t a children’s title?). The art in the book is related in style and quality to the art in Bone, but obviously depicting slightly more realistic settings and characters. It is in strict black and white, which works just as well as it did in his previous masterpiece. Here, he relies a bit more on heavy shadows and angular lines. He also allows himself greater freedom between panels, with a slightly shifting appearance that keeps the reader slightly off guard. The general effect is seductive in a way quite different from the rounded characters of his previous work – not inviting and comforting, but oddly beautiful nonetheless. This collection is known as a pocket book but has the dimensions of roughly 9 by 6 inches in size, so it would appear to be quite a large pocket. The issues are also collected in oversized “Giant Artist Editions.” RASL: The Drift collects issues 1-3 and RASL: The Fire of St. George contains issues 4-7. These both have the dimension of around 10 inches by 12 inches. There is also a limited edition hardcover of the first oversized volume, which contains extra story pages along with further bonus material. I haven’t seen these collections myself but I would imagine the extra size makes the art easier to enjoy and I am very interested in reading the extra story pages. Like Bone, this volume gives you feeling that it is going to be one of the best alternative series ever made once complete. It has classic written all over it. My only worry is that if the forthcoming volumes drop in quality (or are never released!) then all the scenes that leave you wanting more will be unanswered or answered badly. That would make this book a lot less enjoyable. I have faith that Smith won’t do that. 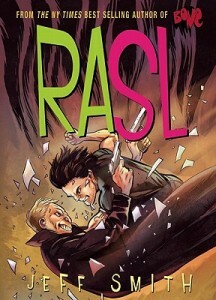 Barring terrible misfortune, I feel that RASL will surpass all his previous work. A dimension hopping tale twisted in time, the first volume of RASL shows Jeff Smith can write deep adult science fiction as well as all ages fantasy. This book raises many questions and has us at TRO waiting desperately for more. Part one of _?_ parts, you will be lost without this part; Essential. Slip into your reading chair, strap yourself in and dive straight into this volume, no need for any pre-reading. Check out issues 8 and 9 as they are corkers! A warning – we have no idea when the next issue will be out! And if you haven’t already read Jeff Smith‘s award winning all ages Bone then that is a must. Was blown away when I read it and I hate having to wait for new issues to come out!!!! Stunning art. I love that incredibly deep black with thick line art style that he’s done here. I looks like it really adds to the feel of the story as well. I’m always interested in some cross-dimensional hijinks when available. It’s too bad that the next publication is still up in the air. Thanks for sharing your review and enthusiasm with us Simon! I think the only conceivable way to read this is in trade…I gave up after two issues, but I’ll pick this up. Hopefully it will all be wrapped up in one awesome omnibus soon enough. For those of you like myself who have become to addicted to this to wait for volume 2 to be published, you’ll be glad to know issue 10 came out 2 days ago and it’s AWESOME!! !